Paperscent™ is an unmatched device when it comes to rendering scents with accuracy. There are 3 steps that consumers undergo when discovering a fragrance: the head note, the heart note and the bottom note. The head note is the first impression of the perfume and the deciding factor for whether or not a person will purchase a fragrance. At this stage, the scents are generally described as 'fresh' or 'sharp.' The heart note follows the head note as it slowly reveals itself, displaying the personality of the perfume and creating its olfactory signature. The bottom note is the smell that remains more durably and defines the true identity of the perfume. 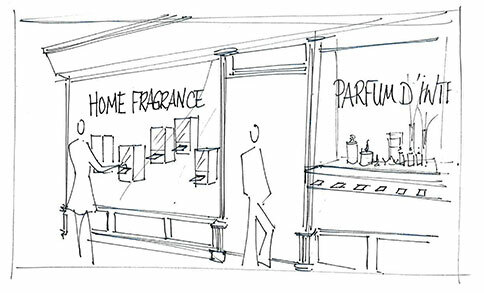 Paperscent™ has been designed to spray the fragrance on the perfume strip at two distinct moments. Depending on the time elapsed between two tests of the same fragrance, the consumer can perceive the heart note, in addition to top note, to reveal all the complexity of the fragrance. Paperscent™ sprays the fragrances inside the device and captures the perfume particles through an active carbon system. The smell is confined in the device so that fragrances are no longer mixed in the ambient air. The sense of smell is the most prominent sense when it comes to memory, making the first impression of a perfume critical to the decision leading up to the point of purchase. Paperscent™ uses the most adapted support for fragrance-testing. 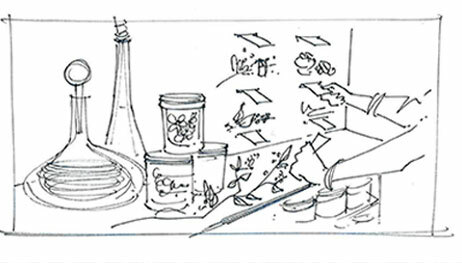 The Paperscent™ perfume strip uses a unique, non-treated tester paper. Freeing the scent: A powerful smell with a hint of alcohol scent allows consumers to immediately decide whether or not they like the fragrance. The progressive propagation within the ambient air: With the notes softened, the fragrance captivates and inspires a vivid memory of the scent. Paperscent™ can stock 350 blotters per fragrance, which means consumer can test a fragrance 350 times without any interference by a beauty consultant. Paperscent™ embosses the perfume strips instantly upon tug of the strip. Upon pulling the paper strip, Paperscent™ embosses the strips with the given brand or perfume name, enabling the consumer to effortlessly identify previously tested perfumes. Paperscent™ simultaneously facilitates the management and supply of the tester strips for both the brands and retailers. Our embossing technique simply prints any pattern, text, or logo on the perfume strips without the use of any ink. Inks release their own scent and could potentially undermine the original notes of a fragrance; Printing without ink allows the paper to maintain its neutral properties, thus maintaining the integrity of the scent. The luxurious rendering offered by this process is critical to avoid any confusion: the consumer can instantly recognize all fragrances tested. Paperscent™ allows everyone to discover fragrances more freely, inviting more consumers to try more scents. Paperscent™ simplifies the first step of the fragrance-testing process, creating an autonomous experience that inspires and motivates consumers to try more fragrances. Paperscent™ can operate autonomously as a result of the unprecedented combination of high capacity of testing strips, a digital application that prevents low levels of blotters or fragrances, and communication and e-commerce features. The fragrance test is now readily available to the consumer thanks to Paperscent™. 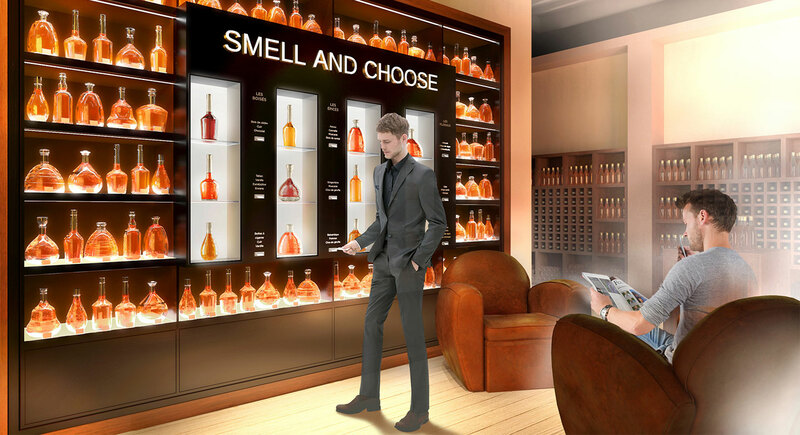 Paperscent™ allows clients to freely discover more fragrances, potentially inquiring with a sales consultant only after he/she is readily engaged in the testing process. Paperscent™ offers a free and qualitative discovery of fragrances. Paperscent™ is a device that can seamlessly integrate to any type of POS or event design. We designed this device mindful of the need for it to blend harmoniously with a wide range of designs. Paperscent™ is entirely customizable, making the device discreet and consistent with the brand identities in which it will implemented. Dimensions of the Paperscent™ device fit easily in any back wall type. 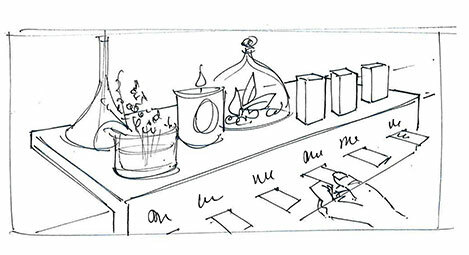 There are no need to remove or renovate the current set up to highlight fragrances. Paperscent™ can be integrated to tables, podiums, walls, windows or Travel Retail installations. It can seamlessly integrate any furniture by adapting to band codes and materials. Paperscent™ can be discreetly implemented to match any event style, allowing consumer to test perfumes with ease, sans a sales team.